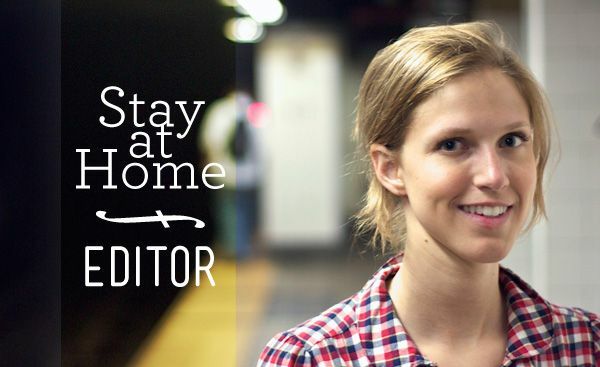 In the Making Bacon at Home series, we interview stay-at-home moms and dads who make money on the side to find out how they make work, well, work. So for the first post, I’m starting with the girl in the mirror: me, myself, and I. 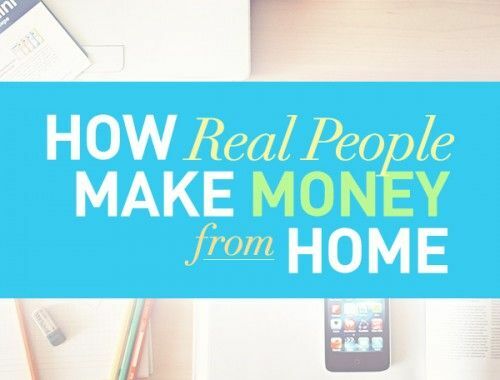 How do you earn money from home as a mom/dad? I’m an editor for a nonprofit. How did you begin working while staying home with your kids? I started my job in-office, but when Johnny started his career in advertising in New York City, I asked to continue working full time from home. My request was granted, and I worked from home sans baby for a couple years before Baby Girl was born. 7:00 – 9:00 — Baby Girl wakes up, and I feed her, play with her, and put her down for her morning nap. I then try to shower and get ready for the day. Or I forego getting showered and opt for getting some work done. Or, if I’m super exhausted, I hand our girl off to Johnny when she’s done eating, and I catch up on another hour of zzz’s. 9:00 – 6:00 — I’m officially on the clock. My day consists of being near my computer at all times while also nursing every three hours and having someone help with Baby Girl. I respond to emails, work on projects, chat with coworkers, participate in conference calls, etc. I take an hour lunch break, which is sometimes when I finally get to shower and get ready for the day. Other times I go for a walk with Baby Girl or meet a friend for lunch (which, I’ve only actually done twice, and it was awesome). And I pray that I’ll get through the day and say pseudo swear words in my head, but not simultaneously. At exactly 6:00, I sign off of my computer for a few hours. 6:00 – 8:30 — Johnny arrives home (hallelujah!!) and entertains our girl while I prepare dinner. We eat dinner, hang out or go for a walk if the weather’s nice, feed Baby Girl one last time, and put her down for the night. And cross our fingers and toes that we don’t hear crying again until morning. 8:30 – Bedtime — I wonder what the heck I did all day and how the day is already over. Johnny and I clean the kitchen and relax for a little while. I then finish any lingering work projects. And half the time Johnny has work to finish also. At the end of the night we put in some time on the blog, which is a mutual outlet for both of us. And then it’s lights out and time to get some sleep before it starts all over again! What’s the hardest part? It’s been really hard adjusting to not having any time for myself. I rarely use my lunch break to actually eat because that would be a waste of time. Imagine me standing with a baby strapped to my chest as I scarf down a pb&j, and that’s my typical lunch. And when our girl is finally down for the night, I can’t just have “me” time because that’s when I get caught up on other household responsibilities, like vacuuming — I’m obsessed with clean rugs and carpets! I live for the weekends when there is time to relax and co-parent. What do you do to stay sane on an especially difficult day? I call Johnny and vent to him. Or I call my mom or sister. Or I vent to a coworker who also works from home with a baby. Talking to another adult really helps me to put things in perspective and simmer down. And I count down the time until Johnny gets home. I also like to have some sort of candy or treat to look forward to at the end of the day :). What advice would you give to someone who wants to make money on the side as a stay-at-home parent? If you have a full-time job that you’d like to do from home, consider asking your boss about trying one work day a week from home. If all goes well, maybe another day or two can eventually be added. It may not be a possibility, but there’s no harm in asking! Any other questions you’d like to have included in this series? 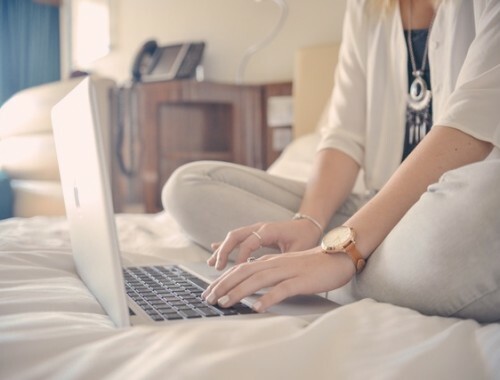 Now that you’ve gotten your first glimpse into working from home with a baby, would you ever consider it? If you’re interested in being a part of this series and sharing your own experiences with staying-at-home and making money on the side, drop me a line here! Nice – If we have kids I’d be interested in trying something like what you’ve got a few days a week since my work is mostly project based. It’s one of the reasons I like to work from home even now. I tend to get a lot done on days when I’m working from the couch! It is a really nice option with a baby. I had a lot of downtime when I worked in-office, and now if I have downtime during the day, I can spend it productively. There’s never a shortage of stuff to get done at home (especially with a baby!). Thanks for sharing your day-to-day activities Joanna. My wife also works from home and she’s loving it. Everyday, she also waits for me after work so that we can spend our quality time together. Having no baby yet, it gives us the freedom to just enjoy the day and full attention of each other. By the way, do you really plan of having a baby five years after marriage? I asked that question because we really plan to do the same thing. We thought of preparing ourselves first for the responsibility of having a baby, financially and emotionally. By the way, you don’t need to answer the question if you find it too personal. Enjoy those moments together. They are much harder to come by with a baby! 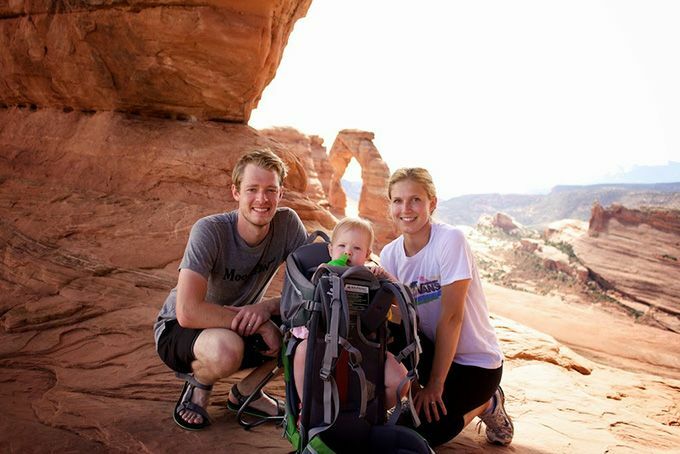 We knew we wanted to wait until we were financially and emotionally prepared before we had our first baby, but we didn’t have a specific time in mind for when that would be. It just so happened that we had our girl after five years of marriage. I definitely want to be a work at home mom. Great post! Thanks, Michelle! It’s a good life. I feel really lucky to be able to work and be a mom at the same time. So, with all that being said, I’ve just got one question: when do you two ever sleep? When I read the replies to your blog readers’ comments from you guys and look at the time stamps on each reply I gotta figure that at least one of you is up and about online here half the night !!! So get some beauty sleep guys, your blog can wait ! Sleep is overrated, didn’t you know? 😉 Johnny and I are both night owls, but we are trying to get better about going to sleep early(ish) during the week. Even before this blog and Baby Girl, we would stay up until ungodly hours of the night. But we always catch up on sleep over the weekend (even if it means tag-teaming it with Baby Girl!). I hear ya, Joanna. Well, I’ll be off to bed soon to get “my” usual 6 hrs of nightly zzz’s ! I’m only 24 and far away from having a baby, but I’ve already given thought about hopefully working from home when I have children. I currently work in the copywriting/SEO field and do freelance writing as well, so thankfully it’s a position that can easily become freelance or a work-from-home job. It’s interesting to see how a typical day goes for you- people think working from home is so easy, but it’s really not! That’s awesome you’re in a career field where you’ll be able to work from home in the future. More and more jobs are transitioning to that, which I think is so cool. I definitely feel lucky to be able to work from home with our baby, but you’re right — it isn’t easy! Johnny always says he’d switch places with me in a heartbeat, and some days I’d really like to switch places with him. I think we just assume other people’s situations are always better/easier! When the day comes that I have a child, I would love to get the chance to work from home! It has been really nice having it as an option! I don’t know that I’ll be able to continue it once we have more than one baby, but for now I really enjoy it! I’m the rare lucky dad that gets to stay home with the baby. I consult about 4 hours a week. Now that he’s getting a little more active, it’s already getting harder to find even those 4 hours! And he’s not even crawling yet!! Fortunately we send him to his grandparents on Fridays so I can make sure my work gets completed each week. I hear ya. When our little girl starts being mobile, it will be very interesting trying to get work done. I have a feeling our house will have lots of gates and rubberbanded cabinet doors. That’s awesome you get one day off with the help of grandparents. I could definitely go for that! awww, love this. :-). I love being home with the kids and am just lately trying to figure out how to add some income into this whole gig, while saving time for homeschooling the kids too. Yes, being at home with the babes is wonderful! It is pretty darn great! 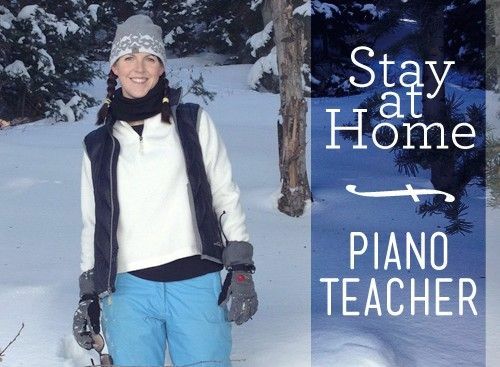 Being a full-time mom and teaching homeschool must be quite the undertaking. You’re a superwoman to juggle all of that! I’d love to hear what a typical week day is like in your home! I really like this new series! Something I am interested in. Do you ever get distracted by house work? Also, do you ever go stir crazy being at home most days? I’m just curious about this work style. I’ve been working from home for a few years now, so I’ve gotten into a groove. In the beginning I used to get a bit stir crazy, so I just make sure to leave the house every day. And as far as getting distracted goes, I try to just think of my job the same as if I were in an office. I only give myself downtime during my lunch break and before or after my work hours. It took a while to get to that point, but it’s the only way to be productive! Nice work Joanna. I have worked from home a few times with our son and it is difficult. There is really no time to eat or get a lot of work done because you have to entertain or keep the baby busy. It is hard work! Thanks, Grayson. It is tough! When I first started back working, I had to just take one day at a time. And, let’s be honest, there were definitely some tears (not just from the baby) from feeling very overwhelmed in the beginning! It sounds like you’ve found the prefect arrangement! Hard to do clearly, but you seem to have all your ducks in a row. Congrats! Thanks, Mindy! Having my ducks in a row definitely varies from day to day. I still have a lot more I’d like to organize about each day, but I’m working on it! Have you thought about what you will do when your baby is old enough for school? That’s assuming you don’t have any other kids which I doubt is the case. Do you think you’d continue to work from home or eventually go get a job that you can drive to and have an office? I have a lot of hands-on employee interaction that I have to do so working from home is a non-starter. I’d love to one day have a job that allows me to work from home though. I’m really good at self motivation! If our girl is still an only child when she starts school, I wouldn’t mind going into the office a couple days a week. I really enjoy interacting with coworkers and being part of a work community. Jobs from home are becoming more and more common, so you could very well work from home at some point. I think Johnny would really like it, too! This blog definitely needs more pics of that adorable baby of yours. I absolutely do not mean any offense when I say this, but do you really think you’d get time to yourself if you were working 9-6 out of the house with a three month old!? You’re not missing anything working from home, and I know you didn’t really mean that, but I guess what I’m saying is the only thing you’d have more of if you worked outside the home is mommy guilt! I’m saying that from experience and I’m only the mommy of a PUPPY so I can’t even IMAGINE working outside the home with an actual human baby. You’re SO lucky!!! Ugh, I hope I didn’t sound like a jerk. I just think if you worked outside the home, you’d be cramming a PB&J in your mouth with a pump attached to your chest rather than a baby, and let’s face it, the baby is wayyyyyyy better! I think you’re probably right, Kristy! I do feel super lucky to get to be home with my girl. I guess I was referring to not being able to get all my work done during work hours and having to do it after she goes to bed at night. That said, it’s a tradeoff that’s well worth it. It’s nice to hear your thoughts and be reminded of what the realities would be like working outside of the home with a baby. I would not only be cramming a PB&J and pumping, but it’d probably also be in a bathroom stall! Give that puppy some love for me! Love this series idea! As a work-from-home momma myself I’m always interested in learning how other people make it work. My biggest problem is most definitely time management. I get distracted by shiny things very easily and all of a sudden am wondering where the day went. Also, I would definitely be interested in hearing how people keep scoring projects. Right now my biggest client is a publishing company that I worked in-house for before I had my oldest. But I am ALWAYS on the hunt for new projects/opportunities and would love to hear how other people go about it. Can’t wait to read more of these! Time management is a toughie, something I’m still working on myself. Right now I’m just trying to take one day at a time. Even though I’m super busy, I know I’m still not maximizing every second! I’d like to hear how people get projects, too! I did some freelance work before our girl was born, and it was always difficult finding my next gig. Hopefully we can get some answers in upcoming posts from others! It sounds like this arrangement works out well for your family. I’m impressed that you can manage it all at one time. My dad worked/works from home a few days a week and loves it. When we were home from school (school break, summers, etc), it was nice to be able to eat lunch with him. I would love if I could work from home once we have kids. It would definitely have its challenges, but it would also have wonderful benefits. And, it would cut down on commuting and childcare costs. One of my coworkers recently mentioned that average day care costs around here are $1200-$1500 per month, per kid. Uggh. Thanks! It’s definitely a struggle some days! My income is enough that it makes a difference, but it’s not enough that it would be worth it for me to keep working if we had to pay for child care. I can’t get over how expensive it is! I’d definitely have to look for a higher paying gig. I want to be a stay at home mom-that works online. Have you thought about getting a mother’s helper? I was a mother’s helper in Paris-to a really great 12 year old! Who spoke perfect English. Anyway, I just helped with errands and helped Zoe go around town. I didn’t do household chores, but a lot of Mother’s Helpers do (dishes/meal prep/laundry) With Baby Girl being so teeny you probably need someone to help make dinner or take Baby Girl for a walk. When I have kids if Grandma isn’t around I’m def. getting a mother’s helper. We’ve actually never looked into that. A lot of they/you did is a lot of the stuff that we could use some help with. So we’ll definitely look at that. Thanks! Have Joanna email re: my experience being a mother’s helper. The great thing for the mom is she is there with the helper so it helps to eliminate the stress of worrying about someone being there with your child while you’re not around. Also, you just get a lot of stuff done as the parent. Wow that sounds extremely difficult. I get to work from home (with no kids) every once and a while which is nice, but I find it tough to stay focused even without a young baby around. It is super nice that you get to save on the cost of daycare and spend time with your daughter when she is young. I hope my wife is able to do something similar when we have a kid. I’m in a similar boat that sometimes I can work from home and help out. But it’s definitely tough to be productive. As some point, it will likely mean Joanna switching from full-time to part-time or quitting altogether, but we’re going to see how long we can make it work.